Bolivia is located in South America. It is a multicultural and multilingual country which has enabled it to preserve the tradition, culture and authenticity of most of its inhabitants. It is an exceptional country because it has more than 8 ecosystems characterized by extensive biodiversity. The topographical difference is notorious in all the Territory, as we have mountains with eternal snow, Amazon rainforest, valleys, Yungas and the Altiplano (High Plateau) that make Bolivia a country worth visiting. Bolivia is bordered to the Northeast with Brazil, the Southeast with Paraguay, Argentina to the south, the southwest with Chile and on the west by Peru. Bolivia was founded on August 6th, 1825. Its capital city is Sucre and the government headquarters is in the city of La Paz. It has an area of 1,098,581 km², and a population of approximately 10,5 million. 55% is indigenous, 25% mestizo (mixed Spanish and Indian descent). From 5% to 15% is of Spanish or European descent. 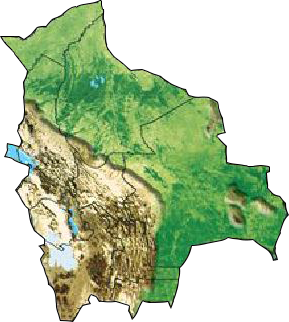 Bolivia is composed of 9 departments, which are La Paz, Oruro, Potosi, Cochabamba, Chuquisaca, Tarija, Pando, Beni and Santa Cruz. Bolivia is characterized by three distinct geographical areas for its climate, topography and altitude. The Area Altiplánica (High Plateau Zone) has an average temperature of 5° to 14°C and an average altitude of 3800 m. The zone of the Valleys has an average temperature of 15° to 25°C and an average altitude of 1000 to 2800 m. The area of Los Llanos (the plains) has an average temperature of 18° to 30°C with an average elevation of 500 m.
Language: The official language is Spanish but other languages are also spoken such as Quechua, Aymara, Guarani and others. Religion: Most Bolivians profess the Catholic religion, but there is freedom of religion (Evangelical Christians, Jehovah’s Witnesses, Mormons, etc.). Type of government: Bolivia is an independent democratic country. Currency: The official currency is the Boliviano, though the American dollar is used for any kind of transaction. From Peru by way of Desaguadero and Copacabana, from Argentina by Villazón, Bermejo and Yacuiba. From Chile by way of Tambo Quemado, Pisiga Bolivar and Avaroa. From Brazil by Puerto Suárez, Guayaramerín and Cobija and air connections with international flights to the airports of Santa Cruz and La Paz.